Visit France’s grand pavilion at Gulfhost which will be accessible from Sheikh Saeed Hall 2 from October 30th to November 1st at the Dubai World Trade Center. Meet the French fine and specialty foods suppliers at the Specialty Food Festival in Hall 3. Dubai, UAE, October 03, 2018: Business France, the national agency supporting the international development of the French economy, will be taking center stage at Gulfhost and the Specialty Food Festival with 2 large pavilions exhibiting products of over 40 companies. Top industrial catering and hospitality companies from France will be showcasing their premium ranges of food service equipment and fine foods. Visitors will have the chance to meet company leaders who will reveal products and know-how and create opportunities to develop business with their Emirati and regionals counterparts. France is committed to UAE’s industrial F&B sector as it maintains its status as second largest partner. With 85% of UAE’s food requirements imported, French exports represent around €400 million in sales annually. France’s leading exports include mainly beverages (30%), dairy products (16%) and fruits (9%). Marc Cagnard, Managing Director, Business France Middle East commented: “France is fully committed to the success of the 2018 edition and is planning for a larger contribution at the next GULFHOST which will take place in 2020, during the World Expo”. 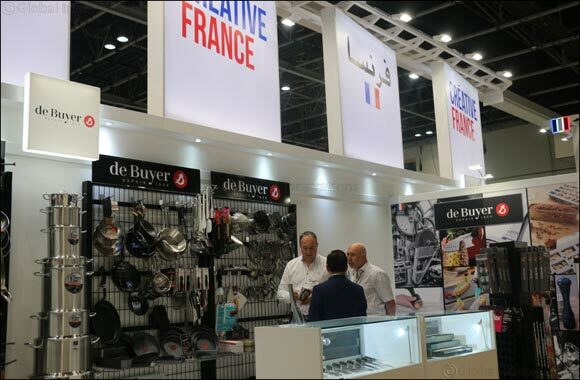 The French Pavilion at Gulfhost will gather companies which will showcase the latest innovation of industrial kitchen equipment, cooking utensils and ranges of tools created for culinary professionals. The French syndicate of the food process equipment makers (SYNEG) will again this year, be one of the main partners supporting the initiative. Another pavilion gathering French companies at the specialty food festival will be exhibiting this year including companies representing confectionary, bakery-pastry, condiments and fine products. Horizon International, a regional partner of Business France, will support the culinary campaign by introducing 6 companies to the show. Other key partners contributing to the show’s success include EVIAN, the number one mineral water in the world and in the Middle East, BADOIT, the sparkling mineral water brand for fine dining and endorsed by top Chefs globally, and CAFES RICHARD, a traditional “French-style” coffee roaster linked to the French gastronomy, Art de Vivre and to Paris (the leader on its market).